The Huntington Office Chair. We built this original chair in response to the input of leading ergonomists and health safety committees across the nation. 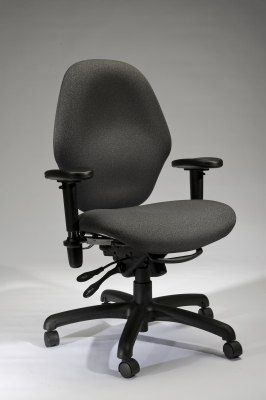 The sleek design and comfort, along with range of ergonomic adjustments, ensure that the Huntington will meet the working demands of any user. Though the standard model is ideal for the mid- to large-sized user, we've developed modifications for smaller users, as well, so that anyone can enjoy the ergonomic functionality of the Huntington. 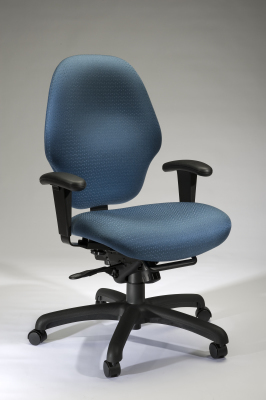 Our Huntington features a free-floating control that allows the seat and back to tilt independently and be locked in any position in its range. Combined with seat height, seat depth, and back height, this freedom of motion is what gives the Huntington its exceptional ergonomics. Back Height: ratcheting back is easily adjusted by lifting it to the desired height. Lifting the back to its highest point returns the back to its lowest position. Seat Depth: adjusted by lifting the front bar or front left lever, which controls the sliding seat mechanism. Chair back also slides to give additional seat depth. Seat and Back Angles: controlled by the right rear lever that allows the seat and back to "free float" independently or to be locked in any position. Fully upholstered seat and back eliminate scuffs on walls and scratches on chairs that commonly occur with plastic chairs. Seat Height: Multiple desk height ranges are available.